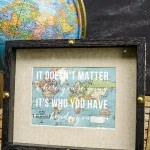 I used a LOT of upcycled maps in the DIY decor for my sister’s Vintage Travel Themed Bridal Shower. 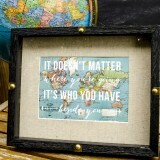 Not only are they cheap, they’re a great way to tie in the travel theme in lots of different ways. 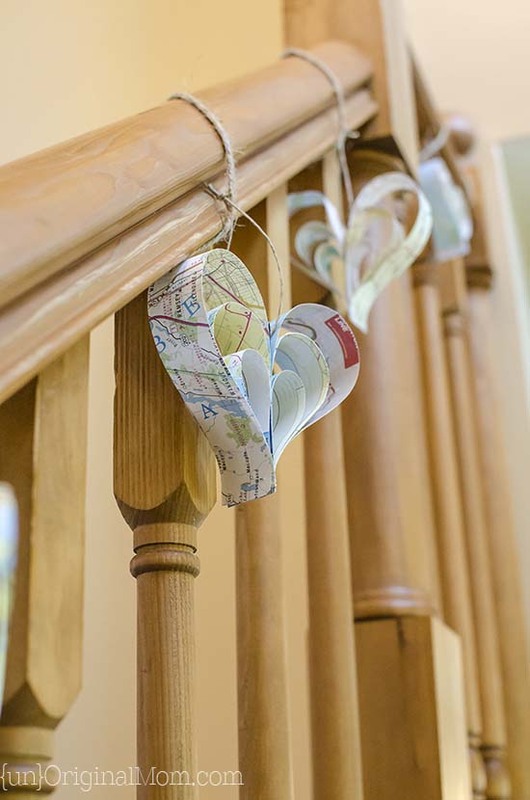 One of my favorite “map elements” to make were these map paper strip hearts – they were so easy! 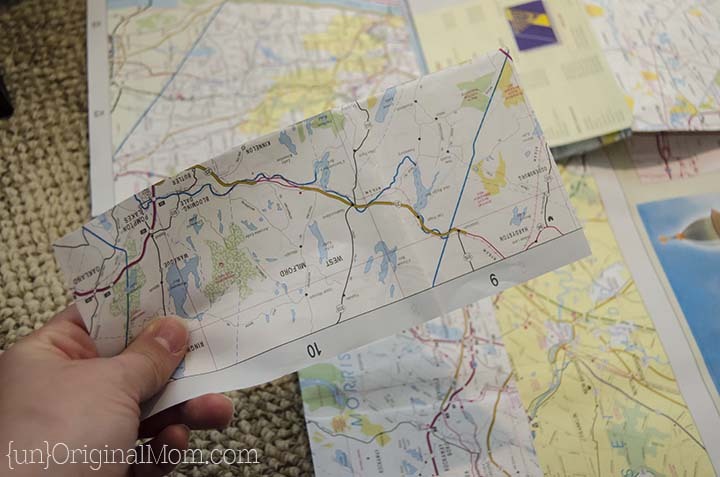 The first step is to get your hands on a map – preferably one that has a map (or map-looking things) on both sides, since both sides of your strips will be visible. For example, I had a map that had mostly advertisements on the back, which wouldn’t have worked well. 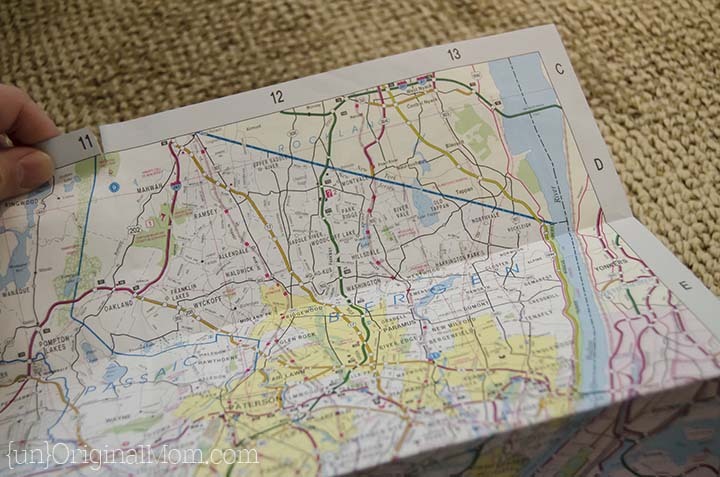 Instead, I used an old road map of New Jersey that my parents had lying around. 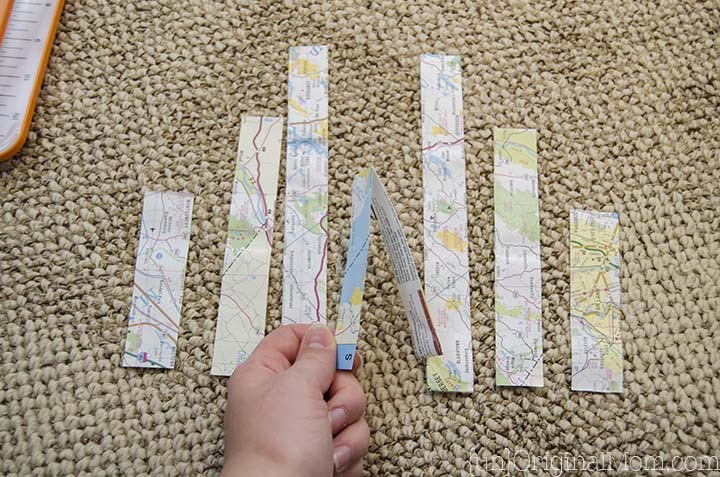 I decided to size my strips to fit inside one of the folded rectangles of the map. 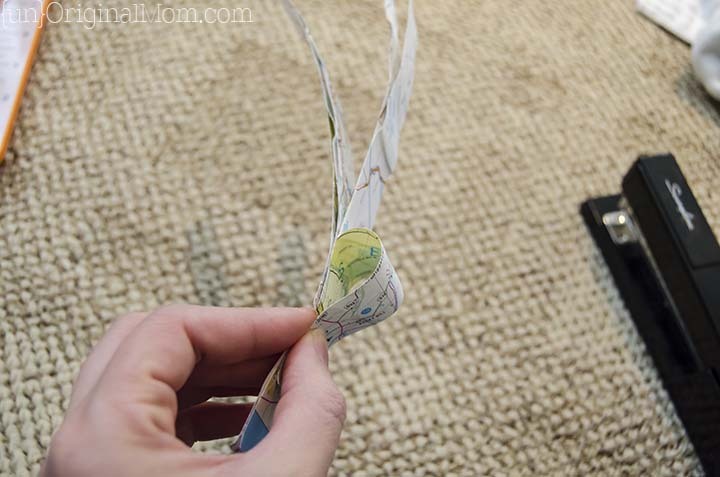 You have to use strips of paper with no folds in them, so it worked well to just cut up each rectangle into strips. 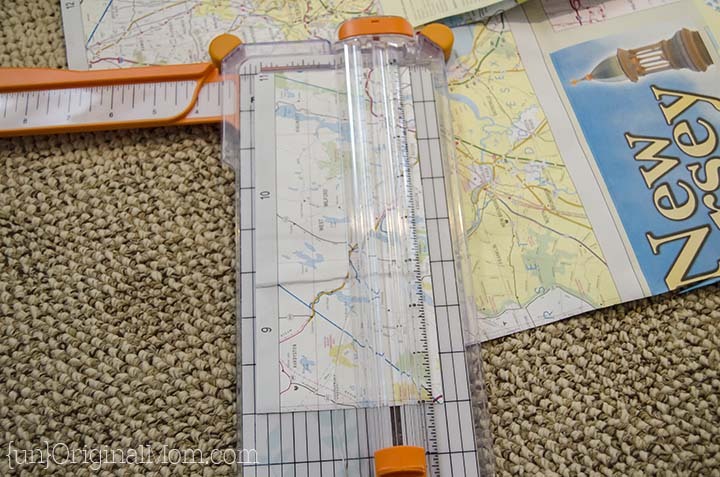 My strips ended up being 1″ wide and 8″ long, but you can experiment with the maps (or other paper) you’re using and find a size that works for you. 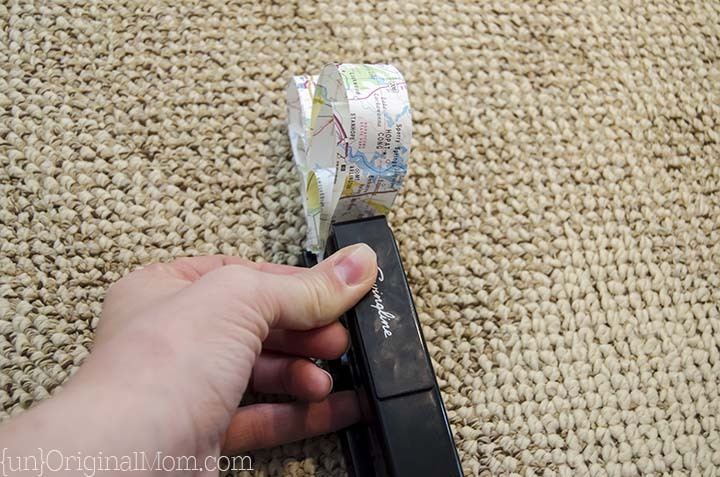 I used a paper trimmer to measure and cut them quickly and easily. 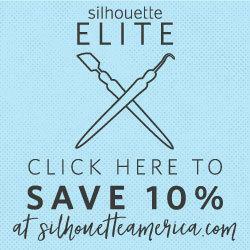 Once you’ve got a bunch of strips, you’ll need to cut them to your different lengths. 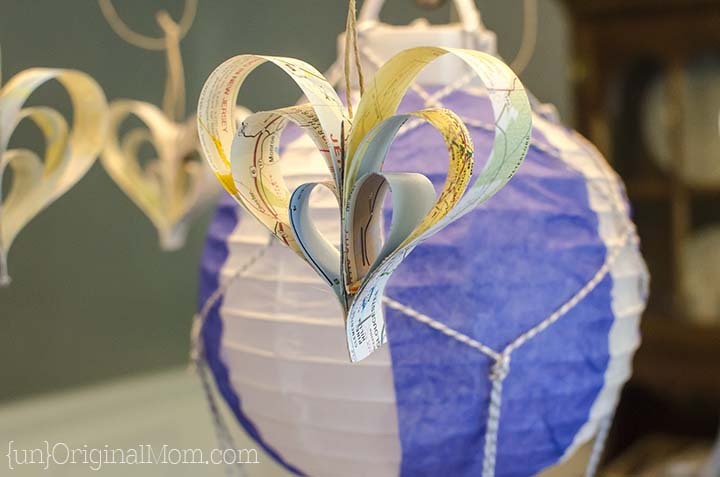 For each heart, I used two 8″ strips, two 6″ strips, and two 4″ strips – plus one extra 8″ strip folded in half with a hole punched near the crease (this will become your “hanger”). You’ll need to stack your strips in this order – shortest, middle, longest, hanger, longest, middle, shortest. Then, pull your “hanger” strip (the folded one) out so that the non-creased side sticks out an inch or so below the rest of the strips. 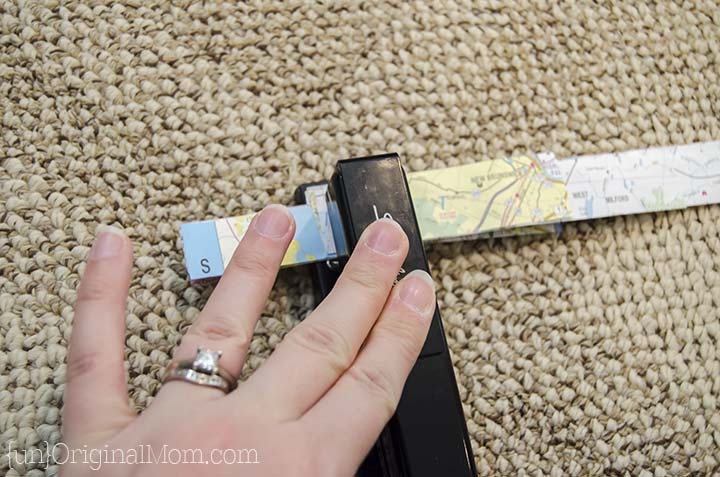 Staple your stack of strips together in the middle so that the staple runs parallel to the edge of your strips. Then, almost like peeling a banana, pull your strips back one at a time and line them up at the bottom. I ended up wanting a little bit of a rounder heart, so I left an inch or so of the hanger strip sticking out and trimmed it at the end. Staple again, horizontally this time. 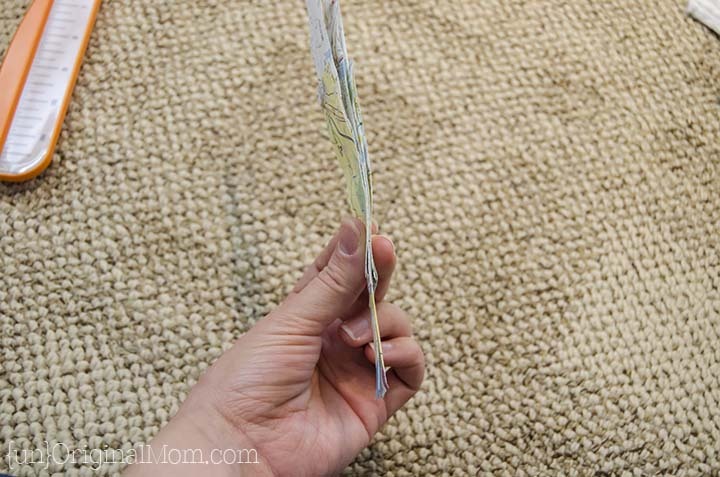 Trim any uneven strips at the bottom to make it nice and neat. 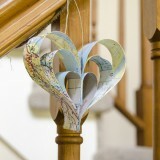 Admire your cute little map strip heart! 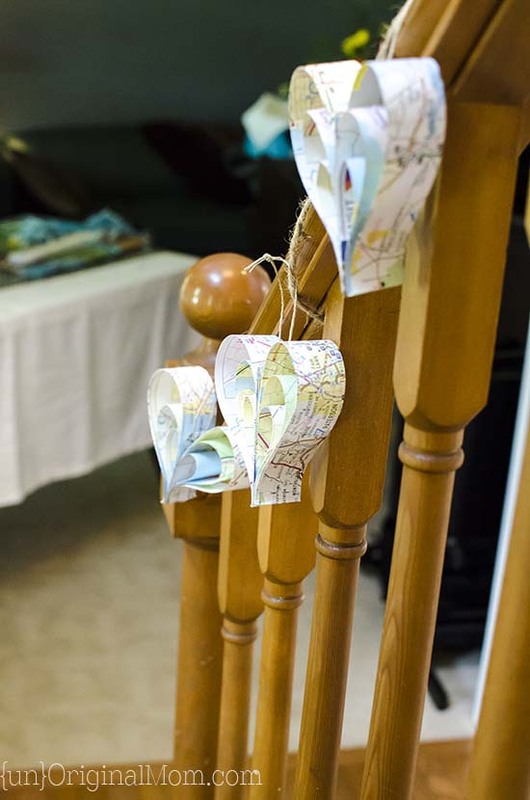 You can use the hanger strip to tie a little loop, and then string them all onto a garland – I strung it up on our banister for some welcoming decor as soon as folks walked in for the shower. Or you can hang them individually, like I did on the chandelier above our dining room table. The only thing to remember is that once they’re stapled together, you need to make sure they don’t get crumpled or folded at all. I made mine in advance and stored them in a little shoebox until I was ready to hang them up for the shower. 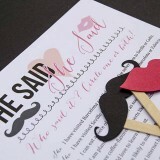 If you need to store them more compactly (or even travel with them to another location for the party) you could do everything but the last stapling step ahead of time, and store them flat in an envelope – then all you have to do at the last minute is peel back your strips into the heart shape and staple. 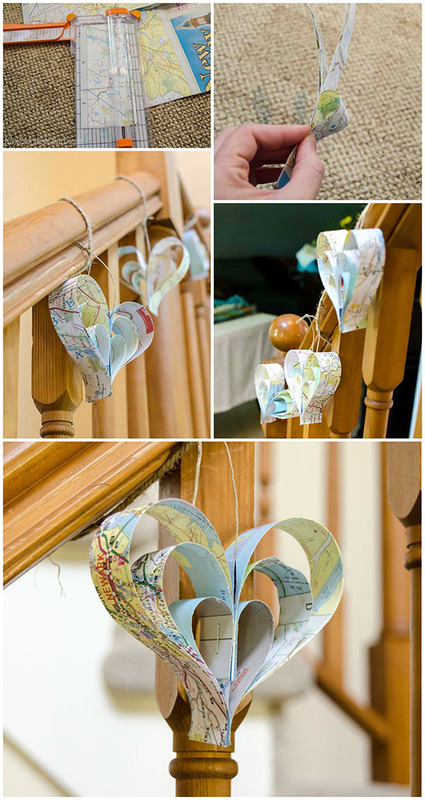 I love how versatile this little paper strip heart technique is – you could make them out of just about anything! Book pages, newspapers (using the comic pages would be so cute! ), printed scrapbook paper, and more. ← Living Room Makeover, Step 1 – Paint! 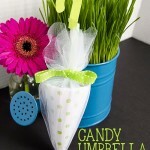 I’m trying to grow my own link party and I invite you to share this (and a couple others) at my Grandma Ideas Sharing Time Link Up at http://grandmaideas.com. 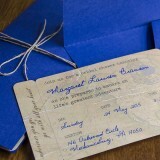 I think that my readers would love this idea, too! The link up ends at midnight on Friday. Hope to see you there! Aw, thanks so much, Nina! 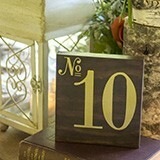 Sorry I missed the party last week but I will try to remember to stop by!! I like this idea. It would be great with sheet music, too. It is definitely on my list to try with old sheet music, I think it would be so lovely! 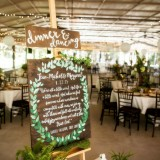 Such and cute simple decor idea! 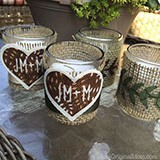 Love this sweet creativity! I would love for you to share this over at my new link party Making Memories Mondays going on now! 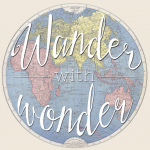 Love crafting ideas that involve maps! Thanks for sharing at Motivational Monday!